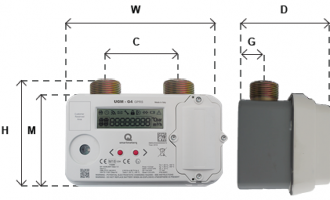 The UGM-G4 Smart Meter Gas is designed and manufactured to measure the volume of Natural Gas and Liquefied Petroleum Gas (LPG). The measurement technology is based on an innovative ultrasonic sensor which integrates also the temperature sensor for volume conversion and permits to obtain an high precision and performance. The gas meters satisfy the new generation of smart devices to fulfill all requirements of European and International standard MID-OIML. Quality guarantee Made in Italy. GSM/GPRS (2G) is the oldest GSM technology and the most widespread. Except for some countries which no longer support it, 2G is immediately available; in the future will be replaced by NB-IoT. LTE Cat NB1 (NB-IoT) (4G) module and it is designed for Europe, Asia and the Paci c region market. NB-IoT is a 3GPP Iot technology very promising. 3GPP Iot technology focuses speci cally on in- door coverage, low cost, long battery life, and high connection density, reaching deep within buildings and supporting large numbers of units. NB-IoT provides advantages in e cient battery operation and improved maximum coupling loss of +23 dB compared to 2G or 3G, therefore enabling underground coverage. In the near future it is expected to be widely available. LTE Cat M1 (US) (4G) module and it is designed for US market. LTE Cat M1 is also a 3GPP Iot technology, and like NB-IoT focuses speci cally on indoor coverage, low cost, long battery life, and high connection density, reaching deep within buildings and supporting large numbers of units. Since LTE Cat M1 technology is much closer to standard LTE network deployments, it enables applications that need more bandwidth and latency similar to higher speed LTE categories. LTE Cat M1 also includes extensive power saving modes and better coverage as compared to 2G and 3G. It uses 2G connectivity to guarantee broad geographic coverage: UGM-4 can activate on existing 2G networks and still leverage the bene ts of LTE Cat M1 and NB-IoT technology once 4G becomes available. It is the perfect solution for a migration path for existing GPRS service to 4G. 3G technology is another technology available in the market and in near future will probably be replaced by NB-IoT. This model is specific for Europe, Middle East, Africa and Asia Pacific market. UMTS/HSPA (3G) but it is designed for North America market. UMTS/HSPA (3G) but it is specific for Brazilian market. Today 3G technology is the most widespread technology in Brazil, instead 4G is not very spread. We offer 8 different models based on different GSM module technologies because our mission is to supply GAS market needs worldwide and offer a product adaptable to any market requirement. Wireless M-BUS was originally created to operate only in 868 MHz band (another license-free band in Europe) which gives a good trade-off between RF range and antenna size. 868 MHz has a lower link budget compared to 169MHz: it is suitable to small buildings monitoring applications. Normally this protocol is for one-way transmission. In case of bi-directional is very energy expensive. The UGM with this option can transmit only. Long Range Wide Area Network is a protocol developed by LoRa Alliance and it is part of a technology called LPWAN (Low Power Wide Area Network): this technology was developed for create battery-powered sensor that can send and receive messages using as little energy as possible to save battery power. LoRaWAN has a very low consumption of battery compared with Wireless M-BUS, and has major signal penetration compared to 169MHz and a lower transmission power signal than Wireless M-BUS. The LoRaWAN modulation is a right choice in case of RF network because the antenna design and the antenna performance is better of other technologies. There are additional frequency dedicate for each country. See the next option release. FC, Near Field Communication, is a technology that enables two electronic devices to establish wireless communication. NFC technology allows gas meter interact with IoT devices such as smartphones or tablets. With NFC technologies an utility company can manage a prepaid service for his customers: for example a customer can purchase credit and transfer it by smartphone to the meter.When the credit is empty, the customer gets a notification in the APP for buying credit. NFC improves the supply chain (supports track and trace functions), consumes low energy, allows a customized access (customers can view only data, utility company can manage readings or customer communications) and help maintenance (utility company can send usage tips and service phone numbers to customer while maintenance personnel can view log errors or load firmware updates). ZigBee, an IEEE 802.15.4-based specification for a suite of high-level communication protocols used to create personal area networks, is a low-power, low data rate and close proximity wireless ad hoc network. The ZigBee specification was created for a simpler and less expensive technology than WPANs (Wireless Persona Area Network) technologies such as Bluetooth or Wi-Fi. Due to his low power consumption his transmission is limited to 10-100 meters line-of-sight but ZigBee devices are capable of transmit data over long distances bypassing data through a mesh work of intermediate devices.In a lot of county worldwide ZigBee uses 2.4 GHz for commercial use. ZigBee is used in low data applications that require long battery life and secure networking. UGM-G4 can have an earthquake sensor, a sensor that can detect the seismic waves of an earthquake and if is detected shut down automatically and immediately the valve. Earthquake sensor is required in gas meter in a lot of countries worldwide: fires or explosions due to gas line break can be more damaging than the actual earthquake itself. UGM standard is IP55 degree. The International Protecting marking define the first and second digit by the follow protection degree for solid particle protection and liquid ingress protection. IP5x means that the enclosure of UGM-G4 provides protection against dust: the ingress of dust in the enclosure is not entirely prevented but it doesn't enter in sufficient quantity to interfere with the satisfactory operation of the equipment. IPx5 means also that the enclosure of UGM-G4 has a protection against water jets: water projected by a nozzle (6.33 mm) against enclosure from any direction doesn't have harmful effects on UGM. IP6x means that the enclosure is dust tight: in the enclosure there is no ingress at all of dust and there is a complete protection against dust contact. IPx8 means also that UGM can be immersed permanently in water up to 1 meter of depth: the immersion has not harmful effects on UGM. 110 140 123 120 32 3/4"
250 140 123 120 32 3/4"